No organisation can be complacent about IT security in general and data in particular. On top of regulations that must be observed, the implications of failure can be serious. Computer Application Services Limited (CAS) has long included ISO27001 data security accreditation in its list of certifications. Providing services to RAF and Army training sites, CAS security levels go higher still. However, it is in connection with Workpro software, CAS's case management solution that the government's new Cyber Essentials certification has been adopted. Private businesses, major corporations and government departments need to know that information used via Workpro is protected. Human Resource department case work and complaints management are two particularly sensitive examples, but any project case work is important to its owners so the standard is applied across the board. CAS is pleased to have been awarded the Cyber Essentials certification by IT Governance Ltd, a leading cyber security services provider and CREST-accredited certification body for the UK Government’s Cyber Essentials scheme. 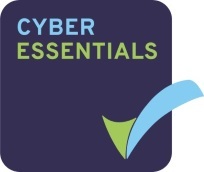 The Cyber Essentials scheme was officially launched on 5 June 2014. It is emerging as the default minimum standard for cyber security. UK organisations need to prove their compliance with the scheme in order to bid for government contracts that involve the handling of sensitive and personal information, and the provision of certain technical products and services.